ysabetwordsmith | Poem: "The Only Thing Sweeter"
Poem: "The Only Thing Sweeter"
This poem is spillover from the November 8, 2016 Poetry Fishbowl. It was inspired by prompts from ari_the_dodecahedron , sweet_sparrow, technoshaman, helgatwb, callibr8, thnidu, shiori_makiba, Anonymous, and Shirley Barrette. It also fills the "family" square in my 10-4-16 card for the Games and Sports fest, and the "hearth and home" square in my 11-1-16 card for the Fall Festival. This poem has been sponsored by Anthony & Shirley Barrette. It belongs to the Officer Pink thread of the Polychrome Heroics series. Warning: This poem contains intense material. Highlight to read the more detailed warnings, some of which are spoilers. While the overall tone is positive and the events give Turq a big leap forward, this poem is an emotional roller-coaster with some extreme highs and lows. Hanky warning! Based on prompter feedback, this tends to make people cry. The poem covers phone conversations with Turq's foster parents. Turq is a ball of nerves and tears. Dao finds out about Turq being tortured and loses his temper, which hardly ever happens so it scares Turq. Mingxia and Ansel are awesome cleaning up the mess. But Turq also learns that his baby sister died, which upsets him, and he's not in great shape psychologically so he doesn't understand a lot of what's happening or why he feels the way he does. As family reunions go, this one is pretty effective and also typical in terms of mixing happy and unhappy moments. Readers with a history of foster care or other family separation, or child/sibling loss, may find this especially challenging territory. If these are touchy topics for you, please consider your tastes and headspace before reading onward. This is a major plot point, so if you choose to skip it, that leaves a big gap relating to subsequent poems. even though he wanted to do it. gnawed on his silicone pendant. Turq finally felt ready to go ahead. chopping wood at the neighboring cabin. a little taste of hearth and home. have to do this alone." tell you how much this means to me." and downs of life," Ansel said. I brought home they adopted as family. whose caregivers weren't as good. There was always room for one more." "I'm flattered by the comparison,"
to meeting your family soon." "They'll adopt you too," Turq warned. "Looking forward to that also,"
not going to scare me off." by a thick flannel sleeve. with a firm nod. "I'm with you." let's do this, before I lose my nerve." Ansel passed him the phone. staring at the luminous screen. "I expect to need it often,"
to the muted purr of the ringer. and fear, happiness and apprehension. back in touch with the family, if that's okay." They chattered back and forth for a while. the boy was quiet and anxious. when I turned eighteen," Turq said. "I wanted to, though. I missed you all." that got me into some mad science torture --"
down at the phone in his hand. "He -- he hung up on me,"
into some pretty deep waters." "but, but he never gets angry." don't all show it the same way." "Not Dao," Turq said, shaking his head. things go wrong, but he doesn't get angry. don't react the way we expect," Ansel said. and started rocking back and forth. "Anger can be scary," Ansel said. about that, and I'd want to apologize." people by being around them," Turq said. pressure you about not reconnecting sooner?" and if there were still barriers to remove." "That's a subtle but important difference,"
call you back as soon as he calms down." The phone rang, making them both jump. "That's what I thought," Ansel said. "Do you want to answer this?" and backed away from him. answer it for you, then?" how may I help you?" rather chat with me for a while?" would relax enough to want a turn. on him so he doesn't get hurt?" generally wearing himself to a frazzle. He wasn't doing anything risky, though. off the face of the Earth." in more detail at a later time." to see if that would help. to calm down," Mingxia said. he could laze against the wall. how are things on your end?" that first impact," she said. Dao can send an email." gardening on the sunny days." "Oh, you like that too?" Ansel said. my neighborhood; it's by a lake." "I'm a horticulturalist," Mingxia said. "Mingxia has the prettiest garden,"
how it used to look in bloom." "Would you like to say hi to her?" to hear more about ours." "Hi, Mingxia," he said shyly. a lot of wild space in them. and then asking about his family. as they renewed their connection. the soft collar of his shirt. but the tears never dried. handed the phone back to Ansel. the dojo to practice some more." "That's a good coping skill,"
Ansel agreed. "How are you? you got some bad news, too." and tried to wipe his face with his hands. Ansel passed him a box of kleenex. had a baby who was really sick?" Turq said. "Baozhen died when she was two." "I'm so sorry to hear that," Ansel said. with the tissues. "I didn't even know her." Baozhen before you left," Ansel said. "Yeah, sort of, but just through the glass,"
way bigger things to worry about." A sob hiccupped out of his chest anyhow. that's really sad. Of course you're upset." hunching into a miserable knot. "Ah, come here," Ansel said. "You can cry on me, I won't melt." down around both of them. slowly dimmed in the window. At last the tears ran their course. "That was rough," Ansel said. "How are you doing now? his voice hoarse from crying. "God, I'm such a mess." to bring him a bottle of water. "Here,"
take a good drink. That should help." to refresh him somewhat. "Thanks." "I'm glad I could be here for you." feel so broken and useless." feel about your family now?" Turq gave him a watery smile. want to keep in touch?" it crackled. He let go. "I just got them back," Turq said. "No way am I willing to lose them again. I don't care how much it hurts." some bumps, but it's usually worth doing." "They're my family," Turq said. might not recognize that," Ansel said. is what matters. You found each other. but wobbled and fell back onto the couch. "Whoof ... guess I got up too fast." "Are you dizzy? Sick to your stomach?" Ansel asked, leaning over him. to be wobbly," Turq said. "I'll be fine." the last time that you ate?" it must have been almost six hours." get us both some supper." "Sure, I'll be here," Turq said. a slow cooker version of lamb hot pot. I hope it turned out okay, I have no idea." "I'm sure it's delicious," Turq said. "Thanks for the vote of confidence,"
Ansel said as he headed upstairs. Turq's head came right up. "It smells so good," he said. "Well, let's find out how I did,"
Ansel said, hoping it would work. for fear someone would steal it. Then he grinned. "It's great,"
he said. "Thanks for cooking." he'd looked for an authentic recipe. in the repertoire?" he said. if it's not too much trouble," he said. "No trouble at all," Ansel said. could provide comfort along the way. Dao Liáng -- He has golden skin, almond-shaped brown eyes, and short black hair rapidly going gray. Dao's family moved from China to America when he was a little boy, as political refugees. He is the older brother of Fang who is a lawyer, husband of Mingxia Liáng, brother-in-law of his wife's younger sisters Mingmei and Mingyu, and father of Baozhen (deceased girl), Baozhai (girl), and Chung (boy). Dao and Mingxia have also parented a number of foster children, including Turq. Currently they have a white girl, Gwenllian (whom they have adopted); and two black brothers, Zachariah and Zaire (waiting to see what happens). Dao speaks Chinese and English with equal fluency, using Chinese as the home language so that the children can learn it. His day job is providing first aid at events. Dao's first daughter Baozhen was born with serious medical problems, which required her parents to give up the foster children they had at the time -- including Turq -- because all the time and money went into taking care of her. Baozhen died at the age of two. Dao regrets that necessity, and it was his idea to try tracking down all the foster kids they let go of. The oldest girl, Andeana, was happy to reconnect with them and is currently in college. The next-younger boy, Benedict, refused to have anything to do with them. They haven't found the girl Jada, who was just older than Turq, or the infant boy Seth. Dao enjoys painting American subjects in Chinese style. He also likes many Chinese games such as mahjong and go. In Shaolin kung fu, he favors the staff but works bare-handed too. Dao uses his creative skills toward timebinding -- creating a personal narrative that helps make sense of your life path, and being able to pass that along to other people. It's particularly useful for folks who have had a rough time, such as refugees or abused children. Because his family had to flee China due to politics, he's skittish about that, and prefers to avoid the topic unless it's urgent like with an election coming up. 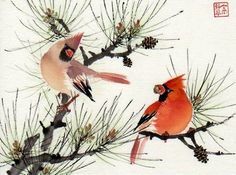 Asian-American art sometimes blends aspects of the two identities, such as this painting in Chinese style with an American cardinal. Timebinding is the act of connecting the past with the present, and passing things on to the future. Humans are nearly unique in their ability to use language and culture to transmit concepts and transcend entropy. Mingxia Liáng -- She has golden skin, almond-shaped brown eyes, and short wavy hair that grows in brown but bleaches to auburn in the sun. Mingxia's family moved from China to America when she was a teenager, as religious refugees because they practice Falun Gong. She is the older sister of Mingmei and Mingyu, wife of Dao Liáng, sister-in-law of his younger brother Fang who is a lawyer, and mother of Baozhen (deceased girl), Baozhai (girl), and Chung (boy). Mingxia and Dao have also parented a number of foster children, including Turq. Currently they have a white girl, Gwenllian (whom they have adopted); and two black brothers, Zachariah and Zaire (waiting to see what happens). Mingxia speaks Chinese and English with equal fluency, using Chinese as the home language so that the children can learn it. Her day job is raising endangered plants native to Missouri. Mingxia's first daughter Baozhen was born with serious medical problems, which required her parents to give up the foster children they had at the time -- including Turq -- because all the time and money went into taking care of her. Baozhen died at the age of two. Mingxia still feels sad and guilty about all of those losses. She has been trying ever since to track down all the foster kids they let go of. The oldest girl, Andeana, was happy to reconnect with them and is currently in college. The next-younger boy, Benedict, refused to have anything to do with them. They haven't found the girl Jada, who was just older than Turq, or the infant boy Seth. Mingxia has done diligent therapy to cope with what happened, but the uncertainty of the missing children has made it hard to finish processing. One huge problem with the foster system is that many children age out without either reuniting with their original family or adopting a new one. This is a betrayal from the system that promised to keep them safe and find them a good home. In local-America, many states have an abrupt cutoff that simply dumps teens on their 18th birthday, which often leads to homelessness. Missouri is one of the few states that lays out a transition process. Ideally, there should be multiple options, as in this example from Florida. T-America does better in general, but it's still patchy. One big improvement is simply that if the state fails to provide a secure family for foster kids by 18, then the state remains on the hook for family support permanently. The state's egregious failures in Turq's case will leave him with quite a lot of restitution on top of the usual offerings. Friends and family keep people going through hard times. Understand how to support and comfort someone in a crisis. It's also important to know how to reach out for support when you need it. Read about the saying "There's always room for one more." It appears in a variety of folktales. Reconnecting with lost relatives is a challenge. In L-America there is a voluntary foster care registry for people who want to reconnect, but the services are extremely limited. T-America does better, but it's still patchy, and not everyone knows about it. In this case, Turq and his parents both want to reconnect and are flexible about goals, so they'll be able to work it out. While I couldn't find much about foster reunions, I did find other advice for reconnecting with people after a long absence. A successful reunion means different things to different people. Realize there will be strong emotions, and try to form a roadmap in advance. Here are some survival tips. Many children in foster care run away, typically for one of two reasons: to visit family and friends, or to escape an unbearable situation. Addressing these unmet needs can reduce the tendency to flee. Turq ran away repeatedly because foster parents were neglectful, indifferent, overbearing, or downright cruel; and in any regard none of the later ones remotely met his needs. Reconnection between homeless youth and their parents is often desirable and benefits from support. Anger is a natural and necessary emotion that arises from unmet needs or desires, and spurs people to make changes. Key skills of emotional competence include recognizing, analyzing, and acting constructively on anger. This exceptionally brilliant article describes how to handle anger in yourself, your family, and others with a healthy approach. I'm particularly impressed by its presentation of options: if you feel overwhelmed, then you'd probably benefit by getting help from a close friend, a caring professional, or preferably both; but if you don't have access to those resources, then now is probably not a good time for deep headwork because it might just destabilize things further. The latter is exactly Turq's situation: he's been focused only on practicalities, has worked on stretching limitations, but hasn't delved into the causes or manifestations of his psychological malfunctions. He needs to be in a secure situation before it will be safe for him to try fixing the deeper damage. Control is an essential part of martial arts philosophy, particularly in the face of conflict. This benefits mental health. Martial artists understand that they cannot afford to lose their temper, both because it makes them more vulnerable to attack and because it raises the chance of them hurting someone unnecessarily. Shaolin monks put a great deal of study into conflict resolution. In particular, a mark of Shaolin mastery is that the practioner feels less and less anger, both in frequency and intensity. A practitioner who angers easily is not a master. Consider how many supervillains (and superheroes) run around vowing revenge on people who hurt their families. Dao throws his phone, takes a walk, regains his self-discipline, and is fine fifteen minutes later. He still objects to what happened, but his emotions no longer control him. You can explore the steps to become a Shaolin monk. 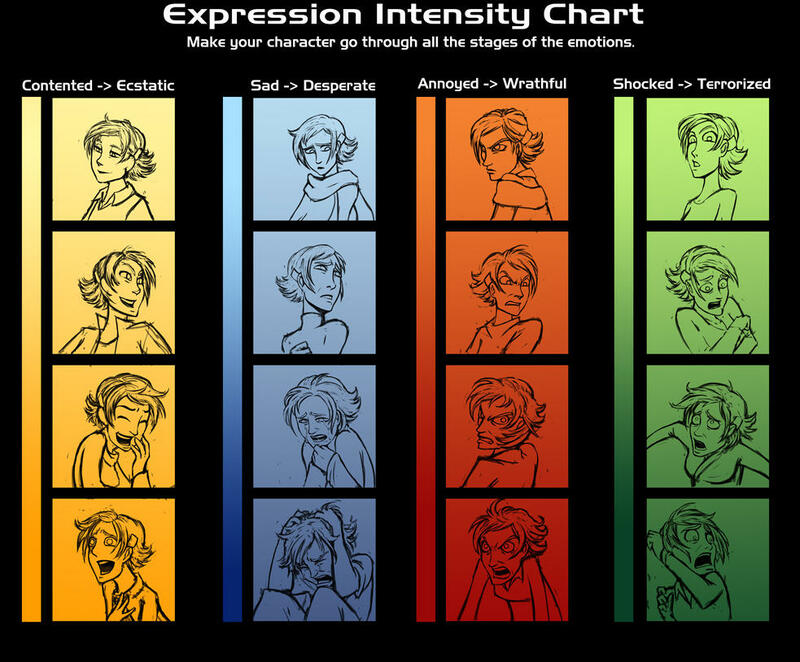 Emotional intensity can be laid out along a spectrum, such as from annoyance to rage. It also varies with personality, and you can measure yours. 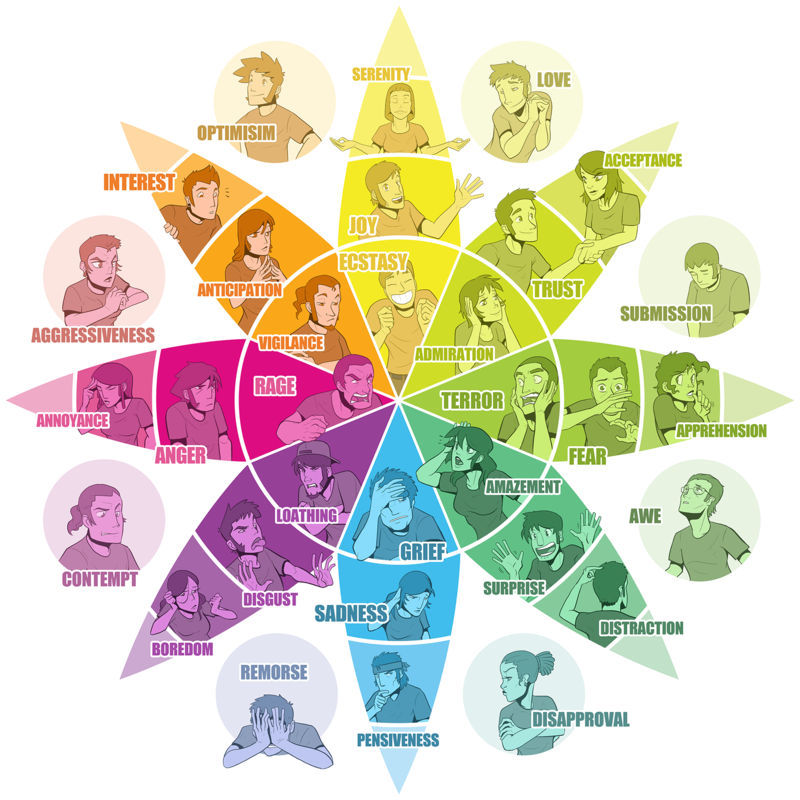 The evolution of emotion shows in this emotion wheel, which lays out the basic feelings in different intensities and blends. Opposite emotions appear across from each other on the wheel. Emotional regulation is a fundamental aspect of emotional intelligence. Foster care and other traumatic experiences undermine its development. Turq has minimal ability in this area due to those factors plus the challenges of shapeshifting and its attendant hormone swings. Emotional regulation skills include such things as meditation, which helps explain why kung fu can support mental health. Understand how to regulate your emotions. Emotional age can differ from chronological age, especially in foster children. Turq's swings in this scene are particularly dramatic -- by the time Dao throws the phone, Turq is emotionally about three. Fortunately Ansel handles this the right way: responding to Turq on the emotional level rather than expecting him to act his chronological age. Grief becomes more difficult to handle when it is disenfranchised and society refuses to acknowledge the loss, as in people saying that foster relatives aren't "real" family. Complicated grief happens when unusual factors make an already messy emotion worse; in this instance, the foster relationship, the brevity of contact, separation from family, and then other trauma interrupting the initial grieving process. By the time Turq finds out about Baozhen's death, he also has a lot more problems mangling his emotions. However, there's a difference between complicated grief itself (as defined by the circumstances of the loss) and complicated grief disorder (a stagnation of the grieving process). This distinction is crucial but often overlooked, because instead of offering help up front for an obvious compound fracture of the heart, L-America tends to wait until it's already turned into an infected disaster. Turq is sad and confused and has no idea what to do, but he's not actually stuck, and it's the stuck part that marks the difference between normal and disordered grief. Support and self-compassion are especially important for healing complicated grief. Know how to work through your grief or help someone else grieve. Validation is a crucial way to communicate acceptance. Because Turq doesn't understand a lot of what he's feeling, he needs someone to help him identify, express, and normalize those emotions. This usually happens in early childhood, but with traumatized children, it may be necessary to go back and fill in what they miss. Dao and Mingxia actually laid down a good foundation for this, but Turq has been through so much that sometimes he has trouble finding that solid rock under all the muck. Learn how to validate yourself and help an insecure friend. Removal from the home, no matter how urgent, inevitably causes trauma. This disruption of attachment often leads to attachment issues which may require extensive repair. Disordered attachment can take different forms, including disrupted attachment. In foster care, many children with disrupted attachment suffer long-term effects from loss and grief. There are tips for parents in coping with attachment damage. Turq has a variety of issues due to neglect (which encourages nonattachment), abuse (which leads to fearful or disorganized attachment), and the secure attachment that was disrupted. The trauma means that he's a mess right now, but the secure attachment gives him a solid foundation, when he can find it. PTSD of abandonment frequently makes people feel like damaged goods. They may also fear hurting other people. Turq is turning his negative feelings on himself, because he doesn't know how to direct them properly. There are resources for abandonment and bonding. People need to cry for several different reasons, which match the different types of tears. Crying very hard for a long time can run through enough water (and energy) for people to feel dehydrated, so drinking water afterwards is prudent. Everyone cries sometimes. It's not a sign of weakness or something to be ashamed of; it's an important emotional skill. Chinese Lamb Hot Pot is among the favorite comfort foods listed by Chinese people. You can make a Chinese hot pot at home. There are slightly different versions for Sichuan and Mongolian. I couldn't find a slow cooker recipe for lamb, but here is one for beef hot pot. Not eating for a long time runs down the blood sugar, which can make people feel tired or woozy. Warm, nourishing food is a good way to revive after stress. I viewed Bao's anger as being directed at the mad scientist and perhaps himself, not at Turq. It is. But Turq can't tell that, because his emotional awareness is all messed up from past trauma. Most of all, Turq is scared because Dao really doesn't get angry, and when familiar people behave in unfamiliar ways, that's very disorienting. Of course, everyone has a breaking point. Dao's is just a lot further out than average, because he's been working on his control for decades. He's a Shaolin and a paramedic, he can't afford to lose his temper. Mad science torture of his son has briefly exceeded the capacity of his calm. Turq will figure it out in time. but such a good ouch! Thank you! I'm glad you found it worthwhile. Sooth. He's very good at EFA. That helps Turq recover faster and better than he was doing without support. is the thread over?!? I just checked your poetry main page, and there aren't any other poems in Turq's thread to fund.....please say it doesn't end here! Love this so much. Rereading.